PHILADELPHIA (CNS) — The newly ordained auxiliary bishop of the Ukrainian Catholic Archeparchy of Philadelphia said Sept. 24 that he was so “full of joy” about his new role serving the faithful that it was hard to put it into words. Clergy, religious and laypeople welcomed Bishop Rabiy to the archeparchy with the liturgy celebrated by the bishop at the golden-domed Ukrainian Catholic Cathedral of the Immaculate Conception. Archbishop Stefan Soroka, head of the archeparchy and metropolitan of Ukrainian Catholics in the United States, was the presider and offered words of welcome. 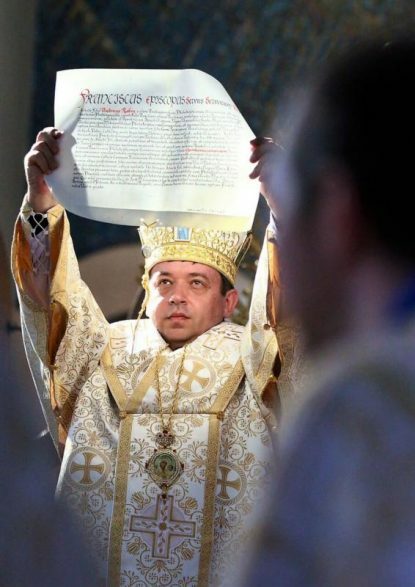 Bishop Rabiy, vicar general and a pastor, was consecrated a bishop Sept. 3 in St. George’s Cathedral in his native Lviv, Ukraine. The co-consecrators were Major Archbishop Sviatoslav Shevchuk, head of the Ukrainian Catholic Church, Archbishop Soroka and Bishop David Motiuk of the Ukrainian Catholic Eparchy of Edmonton, Alberta. He was named a bishop Aug. 8 by Pope Francis, who confirmed his election by the Synod of Bishops of the Ukrainian Catholic Church. At 41, he is the youngest Catholic bishop in the United States. During the Divine Liturgy in Philadelphia, Msgr. Dennis Kuruppassry, a representative of Archbishop Christophe Pierre, papal nuncio to the United States, offered greetings from the nuncio and presented the papal bull on the new bishop’s appointment. It was read in Ukrainian by Father Roman Pitula, the cathedral rector, and in English by Archpriest Michael Hutsko, dean of the South Anthracite deanery. At the end of the Divine Liturgy, Auxiliary Bishop John Bura, of the Philadelphia archeparchy, welcomed his brother bishop on behalf of the clergy, religious and laity. Bishop Bura recalled the life experiences of both Bishop Rabiy and the situation of the persecuted Ukrainian Catholic Church in Ukraine in the 20th century. The underground church, the church of the catacombs, was the church Bishop Rabiy experienced in his home country. “Bishop Andriy grew up in two worlds, two realities, in Ukraine and in America,” Bishop Bura said. “As a 17-year-old youth, he responded to Christ’s call. He entered the seminary in Ivano-Frankivsk and eventually St. Josaphat Seminary in Washington, D.C. He’s lived in Lviv, Ivano-Frankivsk, Washington, D.C., New Jersey and Pennsylvania. “As a bishop, he will reveal the faith and beauty of our church to all believers,” he added. After Bishop Bura’s remarks, Bishop Rabiy went up and down the aisles of the spacious cathedral blessing the congregation with holy water. Bishop Rabiy will continue as pastor of Nativity of the Blessed Virgin Mary Church in Reading and administrator of St. Andrew the Apostle Church in Lancaster, a newly formed mission parish which he founded in February 2013. Bishops who concelebrated the Divine Liturgy of welcome included Bishop Bura; Bishop Paul P. Chomnycky of the Ukrainian Eparchy of Stamford, Connecticut; Archbishop William C. Skurla of the Byzantine Archeparchy of Pittsburgh; Bishop Kurt R. Burnette of the Byzantine Eparchy of Passaic, New Jersey; Auxiliary Bishop Edward M. Deliman of the Latin Archdiocese of Philadelphia; retired Bishop Basil H. Losten of the Ukrainian Eparchy of Stamford; and retired Bishop James C. Timlin of the Latin Diocese of Scranton. Several priests also concelebrated and Deacons Michael Waak and Paul M. Spotts assisted. Seminarians from St. Josaphat Ukrainian Catholic Seminary Washington were the altar servers. Liturgical responses were sung by the choir of the Ukrainian Catholic National Shrine of the Holy Family in Washington.